TRGS 529 safety and quality training – we can certify you! To comply with the 2015 Technical Rules for Hazardous Substances (TRGS) 529 (‘Activities Involved in the Production of Biogas’), at least two persons must be suitably qualified for biogas plant activities and able to provide proof of completing an appropriate course of further training every four years. 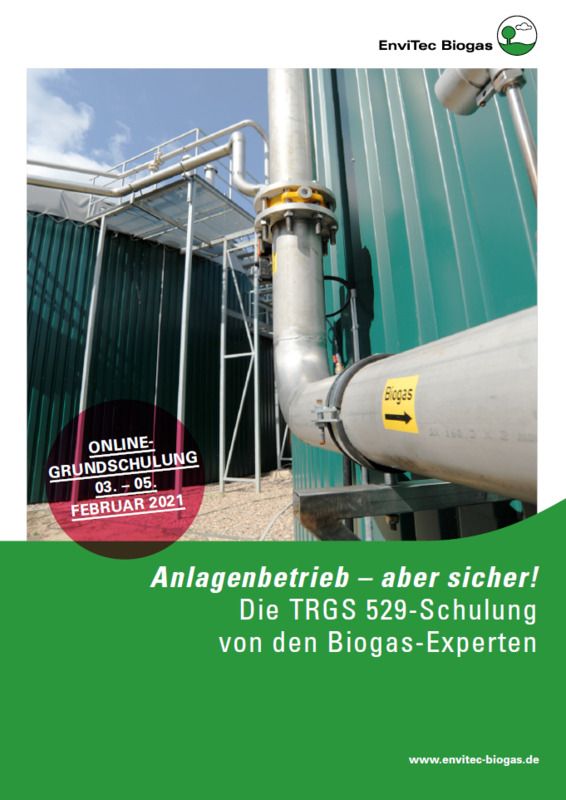 The experts from EnviTec Biogas are pleased to be able to offer you this training course on two dates every year. We also provide in-house training at your facility! Request your non-binding quotation today! We offer a two-day TRGS training course plus certification for operators of a range of biogas plants. Training takes place on two consecutive days and ends with the handover of the training certificate. The workshop is run by our Hazard Control Engineer Mr Reinecke, whose wealth of experience stems from running our in-house operations. The course fee is EUR 420 (we offer a 10% discount to EnviTec Service customers, please specify this when registering) includes both modules plus refreshments during the workshop. Places are limited and will be awarded on a first-come, first-served basis.